bryanta0502 had the most liked content! Ive only used the cheap Chinese carbs on a honda recon and they work well for a couple days then begin to fall apart, leak gas, etc. and the quad begins to run like garbage. The body does not hold up well either, the threads on the throttle cable strip out and cause the slide to pull up so the engine runs on full rpm, has caused a number of accidents including rollovers on this particular 4 wheeler. We ended up using parts like the floats and jets to fix up the original carb body, but it’s probably more advisable to rebuild it. First try a new spark plug if you have had similar problems with that before. Next thing I would do is to verify that any safety switches (neutral relay etc.) if equipped, are working. Check the spots in the wire harness that ground to the frame, clean the grounds. Kill switch working properly? Ignition switch working? Lots of things to check as always lol. Good-luck and keep us updated. Heres what I did- Don’t forget to hone the cylinder. Use lots of assembly lube. Before first start take out spark plug and turn engine over a few seconds to get oil flowing around a bit. Start it and let it idle for 30ish seconds, then rev it keep the rmps varying but not too high. This is so that the rings seat properly. And you need the variations to mimic the kind of conditions it will be facing while you ride- constantly changing rpms. Once it seems to be pretty well warmed up to regular operating temperature or you feel it has run long enough, let it cool down completely. Repeat the rev/cooling process 2 more times. Once you are ready to ride take it easy for the first 10 miles or so. Check all nuts/bolts periodically through this process. Hope this helps. The kit may come with recommended instructions also. I purchased a cheap piston, rings, and gasket kit from ebay last year for my Suzuki King Quad 300. I was very skeptical when purchasing but so far I am very impressed with the results- the brand I used was Namura. I have only put about 100 miles on it since the top end rebuild and have had zero problems what so ever, and I have to admit that I probably take it too far when riding my quad and beat it very hard sometimes. The reason I replaced the original piston and rings was because it was burning oil and smoking badly, the new top end parts fixed this problem and has run like a top ever since! One thing I would recommend is to check ratings on the product itself and if possible on the seller. bryanta0502 posted a topic in ATV For Sale? Post it here. 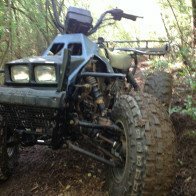 I am looking for fenders for a 1990-1998 suzuki king quad 300 for a reasonable price. I don’t really care what condition they are in as long as no chunks are missing. Its most likely a breather hose. Should stay open on one end. If someone could find the link to this i would like to check it out. Sounds very interesting. Heres the wiring diagram i used to fix up my old bayou. Hope it may help you. Not necessarily, although that is not completely ruled out. What could be your issue is a lack of a full charge-12 volts or so- to everywhere it needs to go. If the solenoid is buzzing then there is something causing less power from getting through. Make sure your battery connections and other connections are tight and that all your grounds are good too. If a ground is corroded then sand it and see if that helps. Hope this helps.